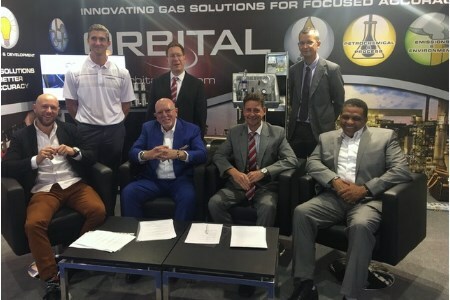 CUI Global, Inc. has announced from the Gastech 2018 Exhibition and Conference that its wholly-owned energy subsidiary, Orbital Gas Systems, has signed a definitive Co-operation Agreement with SAMSON AKTIENGESELLSCHAFT for the global sales and distribution of the Company’s proprietary GasPT®, VE Technology® and combined GasPTi analyser. Under the terms of the Agreement, SAMSON will distribute the Company’s solutions globally, excluding North America and the UK, and become its exclusive distributor. The document contains specific performance milestones, which SAMSON must achieve to become and then maintain ‘exclusivity’. SAMSON, a market leader in flow control solutions for industrial processes, is represented in over 40 countries with more than 4000 employees, more than 50 subsidiaries and over 200 representatives worldwide. Founded in 1907 and based in Frankfurt, Germany, SAMSON develops measurement and control technologies such as regulators and control valves for industries including energy, chemical, and food and beverage industries. A leader in manufacturing control valves for process automation, the company is developing new smart systems that transform process automation to the benefit of its customers and to achieve greater flexibility, safety and reliability in industrial processes. Orbital’s proprietary technology fits SAMSON’s continuing drive to offer leading edge flow control solutions.